The company was founded in 1961, began his career producing panels with maps of municipalities and advertisements that are placed at the entrance of the villages. The production remains unchanged until 1963, when members decide to direct their production to the actual mapping. Thus was born the Study Cartographic "Ortelio", named after a famous Dutch cartographer who lived in the sixteenth century. The Company established in Cusano Milanino produced his first maps of the city of Milan on public display in Milan Subway. Subsequently, the "Ortelio" extends to the production approaching the geographical maps (folded and murals). Innovative was the system folders of the map and the inclusion of the "book" with the index of places and streets and their coordinates, which allowed the system and allows easy reference. Competition spurs the imagination through time and expertise of its founders. The result is the first topographical atlas, better known as "Atlas Blue", showing the topography of Milan city, of all the municipalities of the hinterland and all the capitals of Lombardy, whose first edition dates back to 1973. 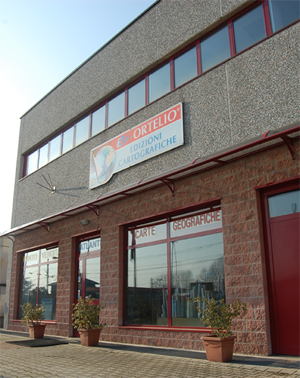 In 1988 there is a change of leadership, the property passes to the whole family and becomes Franciosi Milanesi Cartographic Publishing Ltd. (ECM), retaining the copyright on the name "Ortelio". The production process begins with the ECM consulting the official map of the municipalities and cartographers elaborate upon formal request, customizing graphics, technical maps (plans viable network - PRGC etc.). Computer technology has emerged over the years on the design manual speeding the process of realization, but still preserving the quality of the content of the documents and graphics. A commitment is a constant and continuous updating of data, which is still rewarded with the loyalty shown by customers over the years. Product quality and flexibility are the strengths of this company where everything is "Made in Italy".